Intruders is the new horror film by Spanish director Juan Carlos Fresnadillo, director of 28 Weeks Later. Fresnadillo's second English-language film, the Intruders is about two families (one in the UK and the other in Spain) dealing with unwanted shadowy presences plaguing their children. 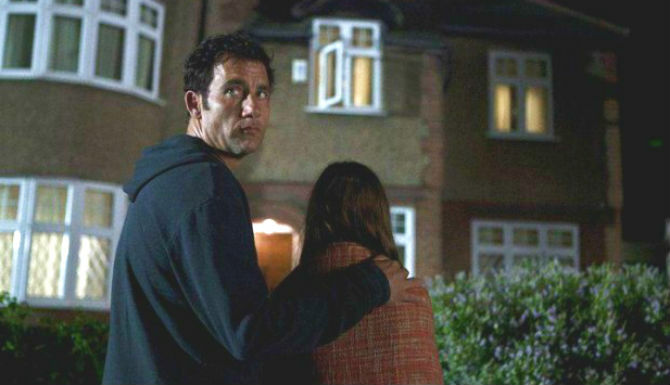 Clive Owen stars as a father (in the UK) desperate to protect his family from mysterious figures-- real or imaginary. This film appears to have similarities with Don't be Afraid of the Dark, Guillermo De Torro's new film, starring Guy Pearce and Katie Holmes (releasing August 26th) and Insidious, which released earlier this year. Intruders releases October 7th. Check out the trailer. What do you think? I think this trailer is pretty cool, so I might give it a shot. I really want to see Del Toro's film and I did enjoy Insidious, though the ending was a bit meh for me. I haven't heard of this film. I'll be sure to keep an eye out for it. Looks like there are some slow parts, but what movie doesn't have those. Kinda creepy looking, though. It's a maybe but thanks for the heads up. @Melissa-- Yep. I'm looking forward to Del Toro's film as well. That one comes out this month. @Film Geek-- I hadn't heard of it either until the other day. Supposedly it's an American film, but they're not doing a good job marketing it. @Shockgrubz-- Very creepy, but yes, I wonder about the 2 family thing. Hopefully it's not slow or in any way like An American Haunting (in which the little girl was haunting herself??) I hate those kind of movies. @Angry Lurker-- Thanks. My best bet is on Don't be afraid of the dark. @I love-- Thanks. I'll have to check out your blog. The trailer did not convince me, but I put a minimum of trust in the Spanish horror (or half Spanish) film, because a good record. I stumbled upon the trailer and thought it looked interesting. The premise sounds good and I wonder if it is more of a ghost story or more psychological. looks very interesting and Clive Owen is a pretty good actor himself! On first glance of the pic it reminded me of the Mel Gibson movie "Crop Circles"
It does look like it'll be decent but maybe done before. The movie still seems like it'll be entertaining. Guy Pearce is an awesome actor. @occhio sulle espressioni-- The trailer definitely could have been better. They didn't really emphasize the two different families. @Slowd-- I agree. I seriously hope it's not a psychological horror film--where the character has been hallucinating the whole time. It feels like a cop out. @Magixx-- Clive Owen is fantastic. I've liked him since his BMW commercials. He's the original transporter! @Natural One-- Do you mean 'Signs'? It does kind of have that feel to it. That said, I hope it's better than M. Night Shyamalan-a-la-ding-dong awfulness. @Real Queen of Horror-- I really enjoy Guy Pearce. Do you remember him in Ravenous? Guy is in the Don't be afraid flick. Clive is in this one. It is so weird how films come in fads. But yeah, Don't Be Afraid of the Dark looks like the best. @Justin-- I agree. Horror movies in the wrong hands can go really bad, can't it? I think Don't be afraid looks like it's the best so far. @Kamatacci-- Yep. This has definitely been the year for ghostly creatures to invade family homes in movies. I hope it's not like Insidious, that was pathetic. @Ricky-- Ha, I forgot you didn't like Insidious. I can't remember why? I'm sure you had a good reason. I'm really excited about this movie, since most of the best horror of the last 10 years has been made by Spanish filmmakers.